In Part 1 of the Train Guide we discussed planning, purchasing and train stations. Once your train arrives and you have stepped on board, most passengers typically head up stairs. The lower levels are reserved for the elderly and those with disabilities. If you purchased a business class ticket, ask the conductor before the train arrives which rail car will be the business class rail car. It is typically at one end of the train and easier to enter from the outside than it is to walk the aisle of each coach car with your baggage. Once you have found a seat, place your baggage in the overhead space and wait with your ticket. If you have a stroller, bike or large suitcase, you are expected to place them on the lower level in the storage area near the exit. Bring a lock and cable with you if you are afraid they might be stolen. Once you are upstairs, it is usually a good time to plug in your laptop and connect to the wifi if you will be using it. After a few minutes the conductor will walk about your train car asking for tickets. In return, they will provide you with a small slip of paper color coded to your destination and with the number of passengers in your party. They may place this paper for you over your seat. This is the signal to other conductors who may swing by later not to bother you again for your ticket. If you change seats mid-trip, bring your paper with you. A common scam on train travel is for passengers to stealthily grab the paper over your seat and place it over their seat. You will be asked again to show your ticket to the next conductor who provides you with a second paper and the scam artist didn't pay a dime. If you head to the restroom or dining car, bring your paper slip with you. Any seat on the train can be a good one. Like on an airplane, aisle seats offer more flexibility. Unfortunately if you are seated next to someone on a window seat that takes frequent restroom breaks, you will be getting up and down just as often. Those who prefer the ocean-side of the train should consider swapping sides just as you’re pulling into LA Union Station – as the train pulls back out again, it changes direction! Train seats may face forwards or backwards. If you get travel sickness when facing backwards when in motion, be sure to secure your forward-facing seat early and change at Union Station. At some point in your journey, you might get hungry. If your snack pack in business class doesn’t satisfy you, head on over to the dining car. This is the lower level of the car just next to the business class car. All of the train cars are connected and you can traverse between each of them by pressing the button on the car door to open the passage. Forget about old-fashioned trains and jumping over the hitch between train cars. This is safe and easy to do with a metal plate at your feet and guard to prevent you from falling out. While there are a few of snacking options in the Business Class car, you can go back and forth to the dining car without any trouble. Once inside the dining car, you might be surprised by the number of options! Unfortunately they are mostly unhealthy. The most filling on the menu include microwave pizza and cup-o-noodles. Still, as far as snacks are concerned, there are a variety. There is also a surprising alcohol selection. If you are on the Coast Starlight, there is a formal dining car called the Pacific Parlour. This is a restaurant on the rail and is somewhat formal. With a little bit of preparation, though, consider bringing your own food with you onto the train. As you your train moves, it will make an announcement at each stop a few minutes before you arrive. This will give you sufficient time to collect your belongings and head to the exit. When you arrive at your final train station and exit the train, it’s time to get to your true destination. If you brought your bike, I recommend heading downstairs one stop before your final destination to unlock your bike from the hook and move other baggage that may have collected around your bike during your travels. If you didn’t bring a bike, taxi services hover around train stations waiting for easy pickups. If you prefer, Uber or Lyft are becoming more popular. If you will be staying at a hotel, most hotels that cost over $100/night have a shuttle that can pick you up on request and later drop you back off at the station. Save yourself the cab fare and keep your hotel’s front desk number handy. 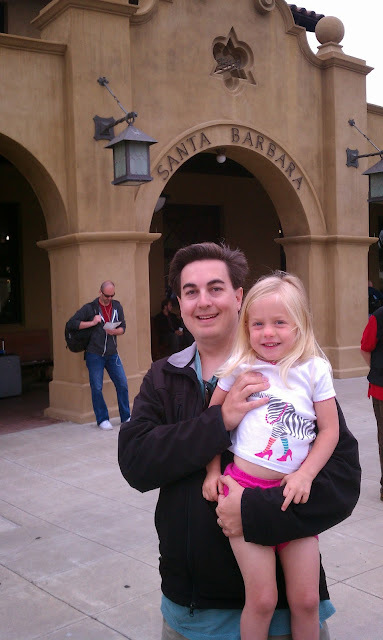 If you are traveling to or beyond Los Angeles from Santa Barbara, you will go through LA Union Station. This train hub has a rich history and beautiful architecture. It handles trains near and far. It also can be a destination all to its own. In the heart of downtown LA, you are walking distance from the Staples Center, Fashion District, Walt Disney Concert Hall, Echo Park, Dodger Stadium, various film locations, Chinatown, Alameda Street and my favorite: Philippe’s. No Travel Channel or Food Network show about LA cuisine is complete without a quick trip to Philippe’s and the story of the original French Dip sandwich. If you are taking the early train from Santa Barbara to San Diego, consider taking a layover at Union Station to take in some of the sights and tastes of LA before moving on. It is important to note that when purchasing your tickets on Amtrak, it refers to LA Union Station as “LAX.” This is not to be confused with Los Angeles International Airport (LAX). The airport is a good 40 minutes away from Union Station in good traffic, which you will never find (you’re in LA!). If you are trying to take the train to the airport, there are a few options, including a shuttle service that leaves each hour. All of the options are expensive and will take you over an hour – and you never want to be in a hurry when getting to an airport. If you want to ride and fly, I recommend flying out of Burbank; the train station is a 10 minute walk from the airport. Whether you have decided to take the train to the park in Carpinteria, up to San Luis Obispo to the Children’s’ Museum, to Anaheim for the Angels game, or to another location, there are a variety of options and reasons for taking the train. Traveling with family on the train is often fun and enjoyable because you don’t have to worry about crashing your car. You can finally play those travel games with your kids that have been collecting dust in the closet. Plus, most kids simply like trains. While I have pointed out a significant number of stressful scenarios, the trip itself is ordinarily stress-free. It just helps to know and be acquainted with all of your options. Often I will walk aboard, take my seat upstairs and just sit and read the whole trip (when I’m alone). The train can be a very relaxing and enjoyable travel option. Ultimately, taking the train is a choice of preference, schedule, cost and flexibility. The train is not always a good option if you need the control, like to drive or have a large group. Amtrak matches the cost of driving dollar for dollar, but that price increases with each ticket purchased. If you’re in a hurry or need to travel at odd hours, driving may be a better option. With all of this in mind, using the train should be considered as an option the next time you travel outside of town. So you have decided to consider taking the train somewhere! I have been riding the train for years and absolutely love it. It doesn’t matter if I’m riding the model train at the South Coast Train Museum in Goleta, the diesel train at the Santa Barbara Zoo, Amtrak’s Pacific Coastliner, a light rail in Germany or the bullet train in Shanghai. The experience is one that I have always enjoyed. What’s more, I’m always excited to give my thoughts and strategies for riding the train, especially for those with families in Santa Barbara. If you are considering the train, I recommend first going to http://amtrak.com to plan your trip. If your destination is anywhere on the southern California coast, you probably have a train station that can accommodate your trip. The trip planner on the site will give you several options. Typical trips in Southern California will travel part of the Pacific Coastliner route, which runs from San Luis Obispo to San Diego and back several times per day. You may also see the Coast Starlight route occasionally available. This goes from Seattle to LA and back but less often. If you’re traveling overnight, the Coast Starlight offers a variety of sleeper car options, each of which gets more expensive with added extravagance. Still, when accounting for the cost of a hotel, traveling while you sleep can be a potential option. Be very aware of bus routes that may be offered in your trip planner and avoid them unless you intend to include a bus route on your trip. A common point of confusion when ordering train tickets is the concept of seat reservations. Unlike an airplane, individual seats on the train are not reserved. Even if you purchase the business class seats, the seats are unreserved and first come – first served. If you want a seat in the aisle, you cannot pay more to guarantee that one will be available. It is based upon availability once you get onto the train. What’s more, there is no guarantee you will get a seat on the train you plan to ride! 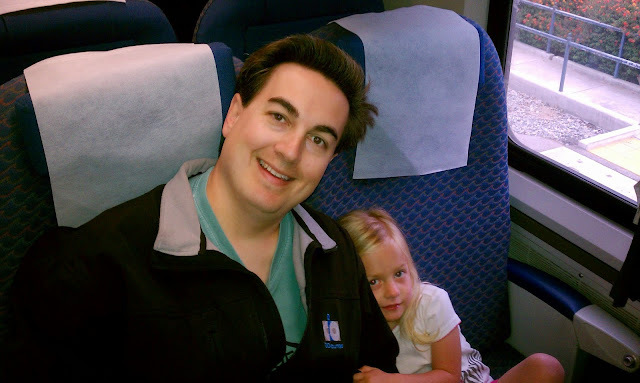 Particularly on busy days when everyone rides the train to an event like an Angels game, the closer you are to the event, the more packed the train can get – people may even be standing in the aisles. However, on typical trips the rail cars are only half full and you need not worry about getting a seat or dealing with claustrophobia. When traveling long distance or on event days, I prefer to purchase the “business class” ticket. This will add a couple of extra dollars to your trip but it is often worth it. The seating in both business class and regular coach is virtually the same – two seats to the right and left of the aisle for the length of the car with a restroom and water fountain at the end. Both coach and business class offer free (limited) wifi and outlets to plug in and charge your phone or laptop as you go. I prefer business class because it is normally significantly less crowded on busy days. 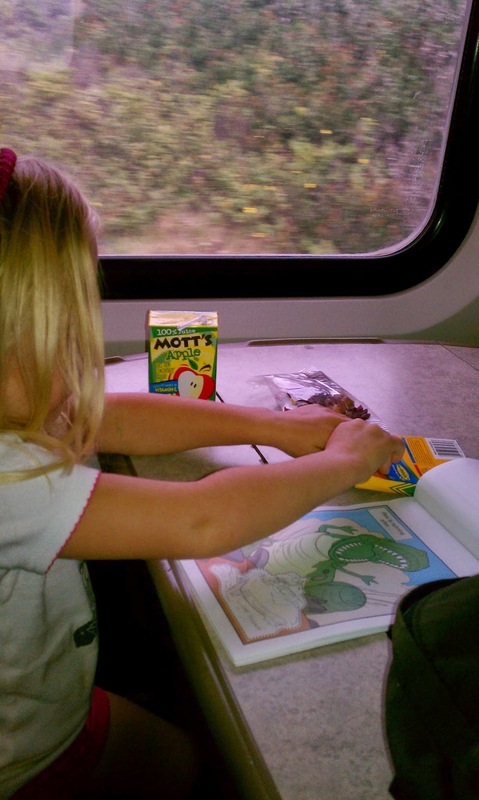 What’s more, each passenger gets a free snack box filled with an assortment of crackers, cookies and snacks. You also get a free soft beverage or can upgrade to an alcoholic beverage for a couple of dollars more. Still hungry? There are often extra muffins, juice boxes and coffee in the back of the car with a copy of the newspaper. Finally, if you are traveling with the family, there are special 4-person bench seats with a fold-out table in between to play card games or color in coloring books. Once you have selected your tickets on the Amtrak website, you may be surprised when you get to the final order button and your total. Traveling from Santa Barbara to San Diego, you might think “$42 one way? Are you out of your mind?” Doing the math, if you drive an SUV that averages 21 MPG the 220 miles to San Diego at $4 per gallon, it comes out to a surprising $42! There are, of course, Amtrak discounts for AAA, AARP, students and the military. If you are traveling alone, the cost often is about the same, but when you travel with more than one person the train quickly gets more expensive than driving. Next to your $42 charge you might also notice the outrageous time of 6 hours to get from Santa Barbara to San Diego and think “that’s twice the time it took me that one time to drive down there.” The train has multiple stops and is not the fastest and most direct mode of transportation available. Still, if you are driving through both LA and Orange County traffic making multiple stops for food and bathroom breaks for you and your family, six hours starts sounding a lot more reasonable. The train also offers the benefit of being able to do something else during your travel time, like reading, watching a movie, working, playing games with your family, etc. If you have gotten over the cost and length of trip, pay your fare and print your ticket on your home printer. If you feel tech-savvy, consider using the QRC code sent to your email instead of wasting the paper. Next, it’s time to head to the train station. The three types of train stations are unannounced, announced and major hubs. I will admit that this is my own naming scheme not necessarily endorsed by our friends at Amtrak. Unannounced stations are typically just drop-off locations. These are typically a small parking lot, a ticket vending machine and some park benches. Examples of this type of station are Goleta and Carpinteria. When your train comes, there may be a short announcement via a PA system but it is otherwise unannounced. At these stations it is usually a good idea to pay attention to the number of tracks available and to determine if there is a Northbound and Southbound side that you should stand on. A normal stop at these unannounced tracks is around 1 minute in length. The trains doors may not even open if passengers are not getting out. If you are at one of these stops to get onto the train, make yourself known and signal the train conductor that you are entering the train. Because these stations are not major stops, it is best to get to the station 15-20 minutes in advance and wait at the bench. Trains don’t typically arrive early, but if they do, you want to be there. Announced train stations are larger than unannounced. They will typically have a large parking lot, extended overnight parking, a ticket agent as well as a vending machine, snack vending machines and often a small gift shop. Examples of this station are Santa Barbara and Burbank. Trains are announced before they arrive. The stops are typically around 3-5 minutes and conductors will walk outside the train often announcing “all aboard.” For a first-time rider, one of these stations is preferred as they offer the highest amount of service with the least amount of ambiguity. You will want to arrive at the train station 10-15 minutes in advance of the expected train’s arrival. Finally, major hub stations like LA Union Station are giant buildings with an even larger parking lot, overnight parking, multiple ticket agents, vending machines, kiosks and even restaurants. Hubs like this serve trains going not only up and down the coast but also other directions and may have smaller municipal tracks. Because of the complexity, it’s best to arrive at least a half hour in advance of your train’s departure. If it is a train station that you are unfamiliar with, head to where the display boards announce what trains are arriving at what bays. Ask questions of the station agents and get directions. Once you know what you’re doing, take a moment to appreciate the architecture, sights and smells of a major train station. Walk about the facility if you have time and pay attention to historical notes posted about the rooms. Never assume that your train will arrive on time – always check online or call 1-800-USA-RAIL for updates. If your train does not come on time or you’re stuck waiting at the station, it is good to know that your 12:15pm ticket will get you on to a 3pm train – this is the good side of the “unreserved” seats. In Part 2, we will review seating, dining and exiting! Originally I posted this article to http://www.Edhat.com but neglected to copy it over to my website when it was revised some years ago. I was reminded of the article last weekend and thought it best to repost it here! As I approach my daughter's third birthday, I am reminded of how much preparation and work is put into the first birthday party. Having experienced and discussed parties of coworkers and friends' children, the first party may be getting a bit out of hand. In Santa Barbara, there is even more pressure, as out-of-town family and friends want to use the first birthday as an excuse for a short vacation. Having been through a child's first party and approaching my second child's first party, it is fresh in my mind. For the benefit of others, and myself, I have prepared a guide to the first birthday in Santa Barbara. If you're paying for a venue, you've already paid too much. Your back yard or a public park should be sufficient for a good time. Not only that, but it's adding unnecessary complexity to an already-stressful event. While there are a number of entertainment options available in town, I feel that it takes away from the event itself. A magician seems fun, and I'm not one to shy away from magic, but it puts the focus away from the one-year-old. Clowns are unpredictable and can leave a scar on the mind of a young child. Ponies and petting zoos are ridiculously difficult to organize and require significant real estate. What's more, all of these forms of entertainment are expensive. Instead, save your money and hassle. Put your cash into the gifts instead. If you are unsure what to get your child or family members are asking, there are a few gifts that are guaranteed wins. Balls, blocks and collapsible crawl tubes are fun, safe and available everywhere. These gifts will get multiple uses over time and can be combined in different settings. The collapsible crawl tubes come in a number of colors, are portable, and just the right speed for a child who has mastered crawling and learning to walk properly. Still, don't be surprised when the child is more entertained by the bunched up ribbon after opening the gift than the gift itself. If it weren't for the pictures, our children wouldn't remember the gifts altogether. This is quite possibly the most important part of the party. Like all big events, they go by quickly. Taking pictures will help you remember everything. Pass the camera around or encourage someone who doesn't seem to be having a great time to be the photographer. If multiple people bring digital cameras, make sure to copy their SD (memory) cards before they head out the door. The pictures will be appreciated for years to come. While you could invite all of the neighbors, family members and children of your friends to participate, you're adding additional complexity. Instead, keep the invitee list small. If people want to come, let them, but don't pressure anyone - the social expectations of a first birthday are otherwise undefined and the ambiguity makes people uncomfortable. Close friends and family should be appropriate - everyone else would appreciate seeing the pictures of the inevitable cake fiasco afterwards. Before my daughter turned one, I had no idea that the first cake was so important. Apparently it's some sort of "tradition" to let your child consume their first piece of cake on their own. Diet and hygiene aside, I simply don't get it. You spend a lot of time preparing for the event and your unprepared and hungry kid is going to smash a cake into your furniture and birthday clothes. Still, the crowd must be satisfied. Go the safe route - use a bib and keep several damp towels on hand to clean up once everyone has had their fill. A year after the birth of your child, you are finally just getting some sleep. 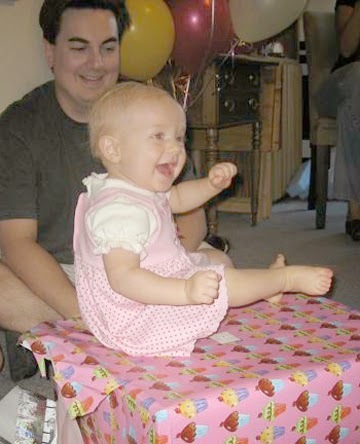 Planning out the first birthday can be stressful, but by simplifying and paying attention to just a few key elements, everyone is bound to have a good time and leave with great memories. If you transfer quickly enough, they will also leave with their SD cards. Precious child and handsome Dad. You are so right on many counts. As a grandmmother I've been through many 1st bdays. Too many guests stresses the child; a few family members should do it for #1. When my children were little (40 some yrs. ago) common sense dictated having one child guest for each yr. of the birthday celebrant; i.e., two kids for 2 yrs., 3 for 3, etc up until at least 5yrs. "Hectic" doesn't make a fun time for children. dude - don't hire a magician for 1 yr olds. Even 2 years olds can barely focus on putting blocks or legos together rather than emptying out boxes and running around in circles. Wait until they're 4.
everyone should steer clear of the supermarket "sheet" cakes... POISONOUS!!! 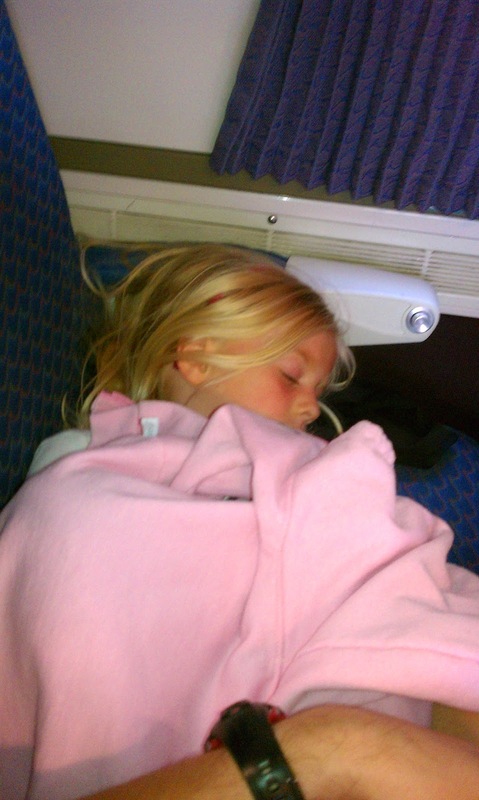 Good ides to give older siblings / guests the camera to have them take the pix too... saved lots of envious meltdowns. A friend of mine was recently looking for advice on a first trip to Disneyland with his daughter. As it turns out, I couldn't summarize my tips into a quick facebook post. They needed a full article, like my Lego Land experience. When I was in a similar position a few years back, I asked around and all of my friends seemed to think that the planning part wasn't a big deal. If you have read any article of mine before, you will know that I’m a planner. For as long as I can remember I have had the belief that if I think through, plan and prepare for an event or situation, I will be safer and somehow will have squeezed an ounce or more of entertainment. One could argue that the ounce gained is not worth the pound of preparation. While this may be a good point, I will still plan and prepare. I can also then share for others in my position who might benefit from excessive planning. If you haven’t been to Disneyland in the last few years, I can tell you that it has changed. The former parking lot is gone. In its place is another theme park also owned by Disneyland called California Adventure. Disneyland could potentially have just extended its gate and expanded the existing park. The gate to California Adventure is across a walkway from the gate to Disneyland. Instead, they split it into two parks and require you to buy separate tickets. I cannot remember a time when I thought that Disneyland tickets were affordable. They continue to be quite pricey – and additionally they are more complicated. Because there are now two parks, Disney encourages you to go to both. For this reason, there are “Park Hopper” tickets. Sure, you could just go to Disneyland itself for the day. Many families do. But for just a little more money, you can then go to both parks. The hopper tickets allow for you to hop back and forth all day as many times as you would like. If your ticket does not say “hopper” on it, you must stay in the park chosen. It is completely normal not to buy a hopper ticket, but the way that Disney prices tickets, there is usually no financial advantage not to. I cannot advise the best place to buy your ticket. In my experience, the pricing on tickets changes so rapidly that I would need to dedicate the site to just doing this. I can say that in checking, I went between a local Santa Barbara Axxess discount book, AAA, Google, Costco and Disney’s website itself. Knowing these prices, I tried to talk down the lady at the reservation line when booking my hotel. They simply wouldn’t budge. What I found overall is that the prices do not vary excessively. Once you have found a discount of some sort, you won’t likely save much with a different discount. Like Apple products, the price you see won’t be different at different retail outlets. I recommend, however, planning the trip first, then purchasing your tickets. Like any major expense, it’s better not to look at the price until it’s too late. If you want the full experience of four days with park hopping privileges, plan to get that and price it out from there. I can assure you – regardless of which package or number of days or hopper passes you choose, you cannot afford them. The one caveat to buying is deciding whether or not you will want and use the Magic Morning pass. Magic Morning allows you into the park an hour earlier than other ticket holders. If you are looking to maximize your experience, your eyes are probably widening as you read this. Formerly one could only get a Magic Morning pass from Disneyland itself and only then if you stayed at the Disneyland Hotel. This meant that the whole park was yours (and a few hundred others) for a solid hour with no lines or wait anywhere in the park! To a certain extent, this still holds true. In my opinion, Magic Morning is still a great deal, worth paying a premium for and still has nearly all the benefits of old. One need not be a hotel guest at the Disneyland Hotel to get these passes anymore. The exclusivity is gone, but still limited. If you want to buy a Magic Morning pass, be on the lookout for it – you may have to buy it in a package deal such as a 3-day pass from AAA or with a room at an affiliated hotel from Costco Travel. Wherever you get your ticket, if you’re in the hole far enough to buy the Disneyland experience anyway, you may as well look for and buy the Magic Morning as well. Now that you have determined how long your stay will be and type of tickets that you want, you’re ready to start comparing prices of hotels. Similar to the tickets, check around for pricing everywhere. I found Costco Travel, MouseSavers, AAA and Disneyland’s website the most helpful. If you don’t live in Southern California, I will do my best to explain your options in order of convenience (and reverse order of cost). If you plan to stay for at least 2 days of park experience, you will need lodging of some sort. You can choose from one of three Disney-owned hotels, dozens of affiliated hotels or alternative non-affiliated hotels. I recommend researching and finding the best fit for you. 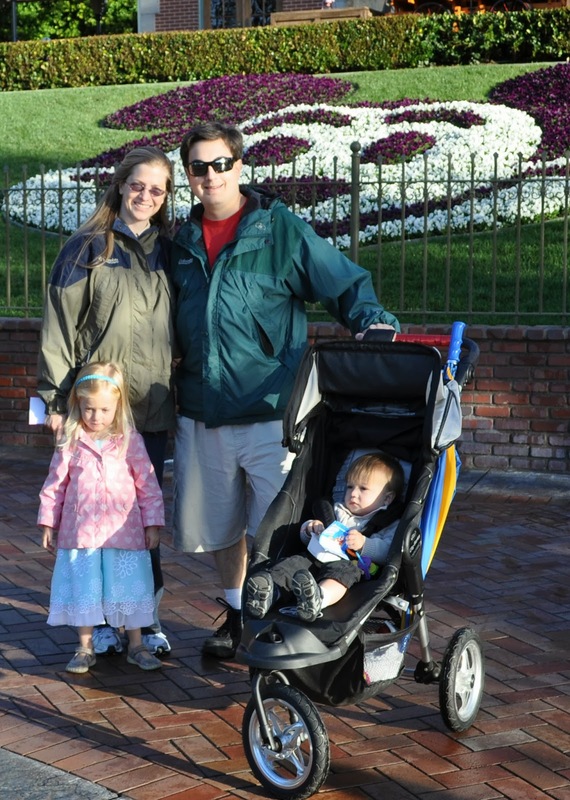 The Disneyland Hotels are easily the most convenient option that you have. You certainly pay for the convenience, but you are also getting a great experience. The quality of all three hotels is on par with a resort. It goes beyond a regular hotel with multiple restaurants, shops, pools and other activities. There are three hotels to choose from now: the original Disneyland Hotel, the Grand Californian and Paradise Pier. The original hotel has been refurbished but still retains all of the charm of its glory days. The one thing that this hotel is now missing is the pickup stop from the monorail. The monorail picks up at the end of Downtown Disney just outside the exit of the three hotels now. The Grand Californian has a woodsy cabin theme. The Paradise Pier has the theme of surfing California. All of them are very nice. The cost of staying at these hotels may be high, but you get so much more than you might anywhere else. Disneyland is known for their superb customer service – and this does not end with a pleasant smile when checking in. They offer daytime and evening entertainment in the lobby for kids and adults alike. During check-in, there may be a line, but your kids can park with a dozen others in front of a big TV to watch classic Disney cartoons. The entertainment is varied: magic shows, banjo players, pianists, balloon artists, you name it. The Disneyland Hotels also offer a concierge package at an additional cost. The first time that I stayed at the Grand Californian, the sales woman reviewing the package that I was purchasing over the phone offered the concierge package as an up-sell. The price was not bad, but it was just one more thing that I was getting nickled and dimed on. I nearly passed on it but am glad that I did not. The concierge package starts with express check-in. When you pull into your hotel, they have already spotted your car, run the plates in their database (you already provided the plates to them) and are waiting for you. Your room isn’t “still being cleaned for you.” Your room is ready and waiting. They then take you and your frazzled family up to your room past the lobby check-in. They check you in from an iPad, so no lines. If you do this, do not let them hurry you to your room. Take your time going through the lobby and walking around the hotel to take it all in. Once you have checked in, you find your bags already there! Apparently the bell boy has a separate and faster elevator than you do. Overwhelmed? Walk over to the special concierge room. This rec room has snacks and beverages around the clock. It has a bigscreen TV playing Disney and plenty of board games. There are tables, couches and everything to get you comfortable. While your kids are gouging themselves on goldfish crackers and raisins from the complimentary snack bar, you can order a beer or glass of wine from one of the room’s waiters (not complimentary). These waiters are also constantly bringing out trays of delicious complimentary snacks including a full fruit buffet in the morning. If you are unfamiliar, a tea sandwich is just a regular sandwich but cut into fours to be cute. I must have eaten a couple of dozen of these. In fact, because we had this room, we avoided many of the expensive meals and snacks in the park. I may not have intended the snacks as a meal replacement, but buying a $6 pretzel seems nonsensical after you have gorged yourself on mini-empanadas just an hour earlier. Doing the math, you may actually save money getting the concierge package once you multiply the quantity of uneaten pretzels. The room is also open around the clock. We found this especially fantastic when we had one child who napped in our room while the other was bouncing off the walls. These rooms are also set up intentionally to show you the evening parades and fireworks – perfect for your kids to see and then rush to their beds down the hall. The room is also staffed with an agent who can buy or change your tickets, make recommendations and even loan you a Disney DVD for the kids to watch in your room. If you will be going to Disneyland for your children for the first time, these hotels are an excellent option and a sure thing. If you simply cannot afford the luxury of the three Disneyland hotels, you aren't alone. Thousands of guests each day stay at one of the many “affiliated” Disneyland hotels. “Affiliated” typically means that they are nearby and allowed to use the mouse logo on their sheets and curtains. These hotels may be able to offer things like discounts on tickets. This is where the Disney-affiliation ends, though. They are otherwise regular hotels. Some are nicer, have restaurants and pools (or even a mini water park) while others are much simpler. Last December, we stayed at the Carousel Inn and Suites. 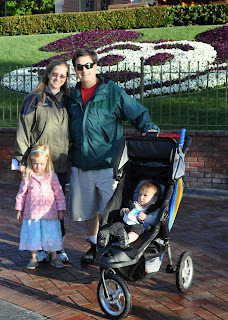 While it wasn't nearly as nice as our stay at the Grand Californian, we were on more of a budget. Our overall Disney experience was still very good. The affiliated hotels have taken note of what Disneyland has done and try to compete, but on a budget. For example, our hotel had a room with a nice panoramic view of the fireworks catered with hot chocolate and snacks where all the families went at night. Expect to get what you pay for and expect pay for what you get with regard to these hotels. Take note and pull up google maps when booking, though. Determine how far your walk will be. This will be key later, especially if you have young or elderly companions. For our stay at the Carousel Inn, we found that it was directly across the street from the Disneyland shuttle drop – very convenient. Alternative lodging is always an option. Maybe you have an RV that you brought with you. Maybe you rented a timeshare or house from VRBO. If this is the case, you need to determine your entrance and parking strategy. Many of the affiliated hotels will have extra parking and will sell you a spot for the day. These may be closer than the Disney official parking spots (which all require a shuttle now) and may even be less expensive. Determine a strategy in advance. Note: there is no cheap parking anywhere. Now that you have decided your length of stay and your potential lodging, you may have noticed that your schedule can drastically affect pricing. If you are able to go mid-week, for example, you will pay significantly less than if you were to go for Friday through Sunday. Likewise, Disneyland has a busy “season.” I recommend seeking out the list of the blackout days – these are the busy times at Disneyland. Really, February through April end up being the lighter “season” when prices go down a tad. If you were hoping to see Disneyland at Christmas, you will pay a premium as this is their busiest time of the year (November through January). Those decorations are beautiful and the parade is a lot of fun, but you will pay for it. As a child, my favorite toys were Legos. There were many other contenders but none were as dynamic or long-lasting. I held on to them so that I would one day be able to play with them alongside my children. About a decade ago I was incredibly excited that Legoland came to be. A whole amusement park themed with Legos! My wife and I went to visit the park on the way back from San Diego one afternoon and were a bit disappointed. Sure, there were Legos everywhere and we had a good time, but the park was a far cry from Disneyland or even Knott’s Berry Farm. It had potential, but after going on all of the rides that fit adults and after seeing all of the displays, we were done in 3-4 hours. Legoland has come a long way. They now have a water park, an aquarium and now even a hotel. There are so many rides and attractions, it can take a couple of days to get through everything. The park is no longer a place to stop by on the way back from San Diego, but a destination of its own. There are so many options available to families at Legoland depending on the experience desired or amount of money to be spent. Researching in advance of my trip this Summer, I was unable to find a central website to describe the Legoland experience. No one I knew had been to Legoland since the hotel had been built. Hopefully this article can serve to address the questions that you may have in advance of a trip you are considering. Be ready to get your credit card running. To take even the simplest of trips to Legoland will set your family back several hundred dollars – more if you plan to stay at the hotel. Much like Disneyland, your ticket purchase is separate from your hotel purchase. One would think that they would bundle these into a discounted package. As of the time this article was written, that’s not the case. After an exhaustive search of legitimate sites selling discounted tickets, it is the least expensive for those with the Santa Barbara Axxess Card . For just $69 each we were able to get two-day park-hopper passes. Costco offers a similar deal at $79. AAA and other locations offer deals as well, but none came close. Before purchasing, it’s good to acclimate yourself to the park’s offerings and decide how long you will be spending at the park. The “park hopper” ticket, like Disneyland, lets you travel between each different park at Legoland. You may choose to skip the aquarium, as most do, but on a hot day, the water park is pretty nice. The water park is relatively small for now, but you can see where construction is making it larger from the higher slides. Currently, the water park does not have a separate entrance from the park – one must already have been through Legoland to get to the water park. This is not the case for the aquarium, which has a separate entrance. The beds come with their own personal night light that my kids enjoyed. There are currently three types of rooms, separated by floor. The bottom floor has a medieval theme, floor two has an adventure theme (ala Indiana Jones) and the third floor has a pirate theme. The more expensive rooms have more Lego wall clings as well as additional Lego creations. If you have always wanted a snail made out of Legos that is the size of your head but you lacked the ability to create one, you may take it home with you. Your whole room is filled with items like this. You are warned, however, that you will be billed $100-$1000 for each item missing. Since you purchased the premium room, you also get additional themed pillows and bed coverings. Your child will be given a code (or a game to find the code) to a safe that is in the room containing a gift. The basic rooms receive gold coin candies while the premium rooms receive a mini figure or small Lego set. The rooms also have a small tub of Legos for the kids to build with while you sit at the provided desk and ponder why it is that someone would steal a $100+ Lego snail fixture. In my opinion, if this is your first trip to the hotel and you don’t look like the Mr. Gold minifigure, go for the less-expensive room. This way, you will appreciate the differences should you get the premium room in the future. There is so much Lego theme throughout the hotel that you will already be blind to most of it anyway. If you have decided to go all the way and get the hotel room, you are in for a treat. It will be an expensive treat, but a treat. Rooms cost between $170 and $370 per night, depending on the type of room and amount of Lego features that you would like in your room. If you purchase the basic room, you and your family will have a good time and likely not even know that you’re missing anything. Your room is similar to a suite in that there is a master bed for the parents and bunks for the kids in separate areas. Your areas are separated by the bathroom and a walking space but there is no door to lock between. If you’re hoping to have some adult time in your bedroom without your kids walking in on you, you’ll have to wait until they have fallen asleep. Your kids will enjoy some very safe bunk beds with safety bars to keep them in. If you have three kids, the hotel has a built-in trundle to pull out beneath the bottom bunk. The whole hotel room is set up to be kid safe and friendly. The bathroom door slides and never fully closes. It offers privacy to the outside, but a kid can never close their fingers in the door (ruining an otherwise nice vacation). There is even a kid potty seat built in to the toilet so that families with those potty training (or just really small butts) can pee without bringing the attachment. The only thing missing is a Lego-themed channel on the TV. Your kids won’t notice as they’ll be playing with Legos on the floor. Your kids will notice the complimentary juice pouches and water next to the large Lego head (you know, your ice bucket). The hotel experience itself is fantastic. They have gone to great lengths to make things fun and easy on you. When you pull up to the hotel valet, you will notice a large Lego dragon. It is rumored to occasionally roar or blow out smoke from its nose, but I never witnessed this. Valet parking is included in the hotel stay. When you enter the lobby, you and your family will notice the giant pool of Legos. Typically when I have a load of baggage to unload, my wife and I will split up to conquer more ground faster. One of us will unload the car while the other checks in and gets the keys while the kids are told to remain in their seatbelts. With the Legoland hotel, this type of strategy is unnecessary and even detrimental to the experience. Let your kids out first and walk them over to the Lego pool (don’t worry, they won’t drown) while you take a deep breath and unload the baggage, valet the car and get checked in. If you got to the hotel earlier than your check-in time and the room is not available, your kids will have no problem building in the Lego pool for hours. Eventually they will get adventurous and wander up the ramp to the giant Lego castle. This castle is nice but looks cooler than it really is. Children will naturally want to climb all over it, but it is for show-only. There are more tubs of Legos and a chalkboard, but otherwise it’s mostly for show. If you make your way down the hallway, you will come upon the elevator. Even if you stay on the first floor, take your time and get on that elevator. While you wait for the elevator, your kids can jump on the whoopee cushion carpet that makes the expected sounds. Inside the elevator you will hear soothing elevator music like The Girl From Ipanima. Once the doors close, though, the lights dim and disco lights turn on. The music switches to various disco or funk hits. Dining at the hotel there are three options. The first can be seen from the Lego pit at the hotel entrance. Near the play castle is a café serving up coffee, juice and snacks. If you want a quick bagel to go, this is your place. Down the hall towards the rooms is the Skyline Bar. This area of the hotel will serve alcoholic beverages but also has a decent menu of foods for the hungry. You will notice that the food is significantly less expensive than room service (as can be expected) but they are essentially the same items and not a far walk. The bar also has an impressive alcohol selection. Your food can be ordered to go and enjoyed at the café while you watch your kids play with Legos or back in your room. Don’t think about bringing it into the park, though, for you are only supposed to bring in bottled water. Across from the Skyline Bar is the Bricks Restaurant. The restaurant serves up buffet breakfast, lunch and dinner. Similar to Disneyland (in my opinion) the food is just okay. The restaurant does their best to cater to as many possible people and cultures simultaneously, but as a result ends up with bland and basic options. Still, it’s incredibly convenient and I am always one to make several trips to the omelet bar. I recommend getting creative with the staff. If you are there early enough that it is not too busy, their staff will make creative options for you like chocolate chip pancakes or chop up chorizo for your fourth omelet. The hotel also offers a decent amount of in-hotel entertainment at no extra charge. While we attended, there was a Lego building competition. Around 50 kids competed, including my own. Each kid got to stand on stage and explain their creation. It was incredible to see these kids, all proud of what they had made. At night we had a Lego pool party with a projected movie. The first half of the pool is only 18 inches deep, so even toddlers can go in, and have independent fun playtime. The Skyline bar opens up to the pool area, so parents can enjoy a drink while kids are misbehaving in the pool. If there’s no other reason to stay at the hotel, it’s the early admission. Similar to Disneyland’s Magic Morning, hotel guests get to enter the park an hour earlier than standard patrons. As you enter the park, you may be under the impression that your privilege is less than special as the ticket-takers allow for anyone to enter. Soon after passing the gift shops, though, you realize that the non-hotel guests are trapped while you are allowed to proceed. I find it necessary to create a strategy for the park itself. I like to maximize every possible bit of enjoyment possible to my stay and will occasionally go to extremes to do so. Before visiting the park, I recommend downloading the line app Ride Hopper. This app for your droid or iPhone will allow you to find out the wait time on any of the various rides in the park. Also, you can get a map and schedule from the lobby of the hotel in advance. Sit with your family and decide which rides you believe you will want to visit. There are carnival-style games that you can do anywhere that distract you and take your money. Skip past those and get over to the Volvo cars. There is a course for 3-5 year olds and another for 6+. This course is no autopia – your kid drives independently of you in a safe car around a track with the goal of not crashing. Attendants are there in case of traffic congestion to help them along. There are gates on the side for easy pictures. Depending on the ages of your kids and their heights, you will want to plan out your day accordingly and hit the rides that will have the longest lines first. Only a sucker will wander the park aimlessly standing in line for 90 minutes per ride and going on only 5 rides for the price of admission. If you have some extra cash to throw around, you can purchase VIP passes. If there was ever a class system, this is it. For $150 (in addition to your tickets), your kids can go to the front of most lines via a special entrance – just show your VIP “Premium Play” pass. They are not cheap, but if you have the money but not the time or patience, it could be the way to go. These passes also give you free food at several of the restaurants. For those without the spare cash, Legoland offers many build stations along the lines of the rides that take longer. Your kid will spend their time building a Lego creation instead of noticing that they’re getting dehydrated in line. Finally, being surrounded by Legos nonstop, you will undoubtedly need to purchase some. Legos in the gift shops are consistent throughout the park and they are essentially the same as they are anywhere – it is a highly regulated toy. You can likely, however, get by fairly inexpensively. If you have three or fewer children, you can go to the build-a-minifigure at one of several gift shops and have them assemble the head, torso, legs and hat custom to their liking. Three custom minifigures for $10 is not a bad deal and can make for some great pictures and much-needed downtime from the rest of the park. If you are staying at the hotel and are not checking out for at least 2 hours, you can charge your purchase to the hotel room and have it delivered for when you’re out of the park – no having to tote around very small and expensive toys all day! This article, while long and detailed, should fill in the holes for parents considering a trip to Legoland. While my tips may not apply to everyone, hopefully you learned something new and can gain some additional enjoyment from your trip. I’m very interested in any other tips that you may have – I plan to go again with my kids in the future.